As kids, my friends and I never tired of imagining ourselves as major league ballplayers, throwing 95-mph fastballs, making impossible catches against center field fences, turning exquisite double plays. There was no doubt in our minds that we had major league skills, even if we didn’t have the major league bodies to match. Much Later, after giving up on my childhood dreams of playing baseball (curse you, Amherst Little League!) and discovering that I was better suited for running long distances, I continued to fantasize about athletic glory. But instead of swatting monster home runs and snaring wicked line drives, I imagined myself unleashing a devastating kick from 200m out to break away from the top 5000m runners in the world, or being the first to enter the Olympic Stadium having vanquished the best marathon runners in the world. Maybe I never really grew out of those dreams. I’ve finished many a track workout, lo, these many years, picturing myself fighting for a place on a podium somewhere. Heck, even warming up and cooling down, I’ve been known to reach the end of the home straight and dip my torso slightly forward, out-leaning my imaginary opponents. The crowd roars, but can’t be sure of the result until my name flashes up on the scoreboard, an the replay shows that I crossed the line a hundredth of a second in front of second place. 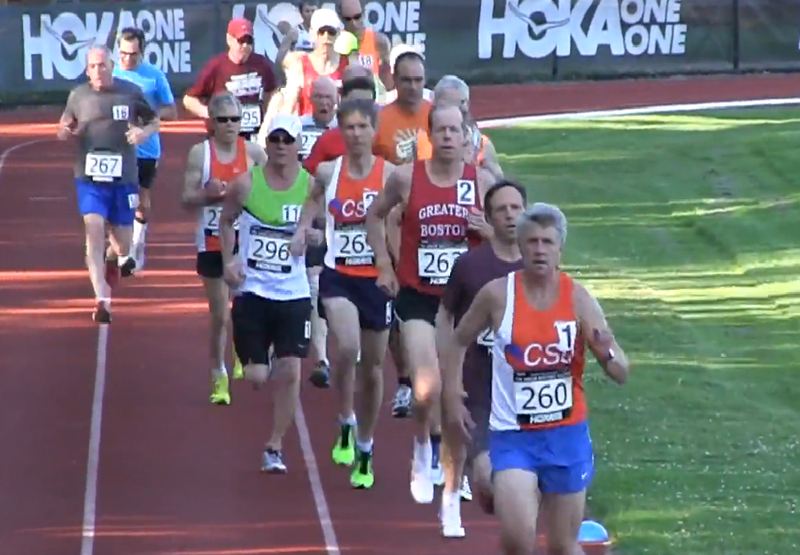 Oh yeah… So on Thursday, I ran in the Seniors (50+) Mile Race at the Adrian Martinez Classic in Concord. The AMC is a really fun meet that has a program of kids, open, and age-group miles, followed by professional races over 800m, one mile, and 5000m. There’s absolutely no rational reason that I should feel apprehension about running in such a race. Naturally, I was terrified. I mean… it’s one thing to play at racing a mile, but the reality is something else again. I happen to feel that the mile is not just a race. It is THE race. Run right, it demands a robust balance of speed and endurance. In four brief laps, a miler progresses from almost effortless buoyancy to near total oxygen debt. Numerous books have been written trying to capture the experience of racing a mile, but the experience remains elusive, mysterious. Furthermore, in spite of what all my running buddies would have me believe, I think the mile demands specific preparation. Mile training is its own sub-genre of distance training, and the idea (for me) of racing a mile without that training makes me very nervous. It’s not just about getting fit; it’s about getting familiar with mile pace. Without the preparation, pacing is a crap shoot — it’s tough to find the right pace when it feels too slow at the beginning, and too hard at the end. So, yes, under-trained and unprepared, I was full of misgivings as I stood on the line waiting for the starter’s commands. At the gun, Terry took immediate control of the pace and the race. Feeling lost, I took the first turn at what I hoped was a reasonable pace and watched as half a dozen runners passed me. I didn’t feel great, but about halfway down the backstretch, my sense of doom began to lift, and, approaching the end of the first lap, I had settled into a nice rhythm. The second lap felt better than the first. Terry was in the lead, with Greater Boston’s Bill Newsham a few seconds back in second, and another guy in third. I had moved into fourth, and heading into the homestretch, I eased by that guy and took over third. I didn’t feel bad at all, and for the first time had the feeling that the race might actually go well. Nothing interesting happened on the third lap. Terry continued to lead. Bill continued to hold onto second about 3-4 seconds back, and I continued to stalk Bill from another 2-3 seconds back. None of us slowed down, but then, none of us had been going particularly fast. At this point, I started thinking that I might be able to kick, and might have a shot at second. On the fourth lap, I tried to accelerate on the backstretch. It seemed like I was making up a little ground, and with 200 to go, I really started to kick. Unfortunately for me, Terry and Bill also had some speed in reserve, and in spite of all my grimacing in the final 100, I wasn’t able to close the gap. Terry ended up with a wire-to-wire victory in 5:10. Bill and I took 2nd and 3rd in 5:15 and 5:16, respectively. In my imagination, we had run brilliantly, and our kicks had been worthy of the Diamond League. It felt that way, anyway. It felt like a mile SHOULD feel. If only I had left well enough alone, but no, I had to watch the video of the race. And in the video, I can see we are just three slowpokes running a little faster than some other slowpokes. It was the same thing as if someone showed me home movies of my ten-year-old self playing baseball, and I realized I wasn’t a budding major league shortstop, I was just a kid fielding tennis balls bouncing off the back steps. It reminded me of an episode of the TV show Malcolm in the Middle where Lois, the mom, takes dancing lessons. In the scenes where she is learning to dance, we see her as she sees herself: elegant, graceful, and attractive. But when she watches a video that someone has made of her, she realizes she’s a klutz, and she was only a good dancer in her imagination. It nearly breaks her heart, but then Hal, her husband, sees the video and is moved to tears. It turns out that he sees the wonderful dancer that she imagines herself to be. It’s a wonderful gift to see with your mind’s eye the inner Olympians, even when the evidence tells you we’re just stumbling old men. After all the professional races were over and all the awards handed out, there was one final event to be run: the “Family” 4×400 relay. In theory, all members of a given team were supposed to hail from the same family, but meet organizers had made it clear that “family” would be interpreted with latitude. In fact, as the meet director walked by a small group of us (CA students, parents, and friends), he encouraged us to enter a team. Chris, a rising junior at CA, thought this was a great idea and immediately started trying to convince a couple of other kids… and me… to do it. In my life as coach of a small track team, I have had to talk a lot of kids into running legs on the 4×400 relay. Surely, this appeal to fill in the last, crucial gap on our “family” team was punishment for past sins. So even though it had been about an hour and a half since I had finished my cooldown, I started warming up for one more lap. I’m happy to say that, although I was by far the slowest member of my team, I did not hurt myself and I had fun. Also, our hand-offs were awesome. This entry was posted in Race Reports and tagged 2-Mile, Adrian Martinez. Bookmark the permalink. Jon, glad you joined in the slowpoke mile fun, made the podium and even grabbed a relay baton. There’s no age limit on imagination, so we should feel free to dream on. Was that lil jon music playing during the race or just in the video? ?